Will you line up for this year’s lethal injection? Want $10 off your bill at the grocery store? Stop by our pharmacy and let us jab a needle full of toxins into your arm! Want to avoid killing off your newborn, your elderly neighbor, and some random unvaccinated cancer patient? Do your part by getting stabbed! Want to circumvent potential death by influenza? Just get your flu shot at any of our convenient walk-in locations. Want to keep your job? Get your mandatory flu shot or your fired – but don’t worry – it’s FREE! It’s that time of year again. The propaganda machine is in high gear, churning out the fear in order to get everyone lined up for their annual flu shots. Widely trusted websites like the CDC, Flu.gov, and the Mayo Clinic are all trumpeting the necessity of this year’s vaccination and proclaiming it to be the best way to stay healthy. The CDC (Centers for Disease Control) held a press conference yesterday (Sept. 26, 2013) in conjunction with the National Foundation for Infectious Diseases (NFID) to kick off this year’s vaccine push. “Our message today is simple,” Dr. Howard Koh, assistant secretary for health at the U.S. Department of Health and Human Services. “Everyone 6 months of age and older should receive a flu vaccine. The good news, according to the government health agency, is that more kids and health care workers got vaccinated during last year’s flu season, compared to previous years. That’s key, because children and people with preexisting health conditions are at higher risk for more serious cases of flu. But, those positive trends are not going to put the brakes on the CDC’s efforts to tout the vaccines, especially among some high-risk groups still lagging in coverage rates. This year the focus is on pregnant women and people who are employed at long term health care facilities. Don’t be surprised to see another rash of “get your flu shot or lose your job” ultimatums for nursing home workers. Last year, workplaces, schools and other activities across the US and Canada instituted policies that forced all participants to receive a flu shot.-Long term hospital employees were fired for refusing to have the toxin injected into themselves. Children were banned from pre-schools and daycares in 6 states. Nursing students were told to have the shot or lose their placements, thus disqualifying them for their degrees. 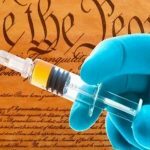 The media and government launched a full-out propaganda assault to force those who didn’t want it to have the flu shot anyway, at risk of their livelihoods and educations. Package inserts for flu vaccines show a multitude of side effects, including death, and yet they are marketed the same as over-the-counter drugs with no prescription needed. Why? 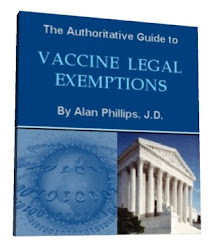 Because in the United States vaccines enjoy complete immunity from lawsuits in the market place. If you are injured or die from a vaccine, you or your family cannot sue the manufacturer of the vaccine. This law enacted by Congress, was upheld by the U.S. Supreme Court in 2011. Flu shots mean big money to the pharmacies, to the doctors, and to the drug companies. The frenzy with which the flu shot is promoted is directly proportionate to the profit margin, but those lining their pockets fail to mention that you could be paying them to give you and your family a lethal injection. Call me a conspiracy theorist if you want to – I’m cool with that – but the insistence of the powers that be that my family and I be injected with foreign substances that have not been proven to be effective and that have mild to severe side effects makes me plain suspicious. There are horrible toxic ingredients in the vaccine. There is a risk of mild to horrific side effects. I don’t trust the FDA, the CDC, or the AMA – they work for the benefit of the government and Big Business – not for the benefit of the public. If the mainstream media is constantly endorsing it, I refuse to participate because they are known propagandists and mouthpieces for advertisers and political agendas. Just like with any other sales pitch, the more insistent the salesman and the less information they want to give you about the product, the faster you should run the other direction. But…Isn’t the Shot the Best Way to Prevent Catching the Flu? 1. Wash your hands frequently when you are out. 2. Use a paper towel to open bathroom doors and turn on taps. 3. Although I’m normally not a big fan of hand sanitizer, use it during the height of flu season if you have to touch things that everyone else has been touching, like the handle of the shopping cart, door knobs, and debit machines. 4. Use antibacterial wipes (or at least baby wipes) to wash your hands and wipe the steering wheel when you get back into your vehicle. 5. Avoid touching your face – this welcomes germs that are on your hands into your body. 6. During the height of flu season, consider taking a quick shower and changing clothes when you return home, particularly if you have been in a germ-ridden place like a doctor’s office or pharmacy. 7. Make sure the kids change clothes and thoroughly wash their hands when they return home from school. 8. I shouldn’t really have to say this, but….wash your hands after using the bathroom and before preparing or eating food. If someone in your family is sick, try to minimize the spread of the illness. 12. If you or a family member are sick, stay home from work or school to prevent passing it on to others. 13. If a family member is sick, keep them isolated away from the rest of the family. 14. Use antibacterial wipes to clean surfaces that the sick person touches – doorknobs, TV remotes, keyboards, toilet handles, and phones. 15. Immediate place dishes and flatware used by the sick person into hot, soapy dishwater with a drop of bleach in it. 16. Teach children to cough into the crook of their arm instead of covering their mouth with their hands. 17. Have the sick person wash their hands frequently with soap and water to help prevent spreading germs through physical contact. If soap and water is unavailable, have them use hand sanitizer. 19. Take a high quality, organic multi-vitamin. 20. Take at least 3000 IUs of Vitamin D3 daily – research has shown a link between a Vitamin D deficit and susceptibility to the flu. 21. Eat lots of fruits and vegetables (preferably organic and pesticide free). 25. Avoid or limit processed foods. Should You Head to the Pharmacy If You Get the Flu? If, despite all of your precautions, you do get sick, you don’t have to resort to over-the-counter remedies and prescription antivirals. These can have horrendous side effects and are rarely effective. 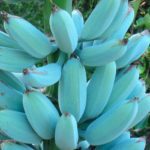 Check out this article to learn more about the treatments from the pharmacy and discover some effective remedies that are as close as your kitchen. 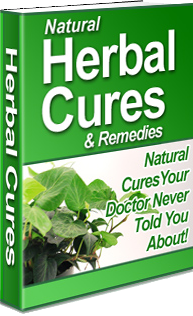 As well, consider investing in nature’s version of Tamiflu – elderberry extract. Scientists have isolated the active compound in the elderberry. It is called Antivirin and is found in proteins of the black elderberry. The compound prevents the flu virus from invading the membranes of healthy cells. The worst case scenario is that you do, indeed, contract the flu. Despite the hullabaloo, you are probably not going to die, be hospitalized, or suffer horrific permanent damage from a bout of the flu. People get sick, but death from the seasonal flu is rare. This manufactured panic over flu prevention is agenda-based. Big Pharma wants money and Big Government wants control. I don’t believe that all health care professionals and flu-shot advocates have ill-intent. I think that many of them have just sipped the mainstream media Kool-aid – the tale-spinners of Big Pharma have slipped in just enough truth to make their theories believable. Most people are deep-down decent and have difficulty believing that such a perverse money/power agenda could exist. I’ll take the risk of illness that my healthy immune system can fight off over the risk of being forcibly inoculated with whatever toxins the creators of these vaccines choose to include. I’ll use my little arsenal of home remedies and come through it without the risk of long-term side effects that have yet to be discovered (or at least, have yet to be made public).